A Correspondent of NAN who visited the complex on Friday reports that parts of the property had already caved into the gaping gully. 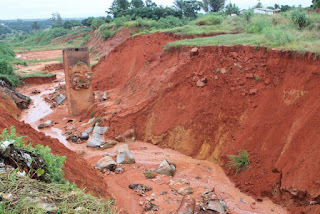 Some of the parts that have been lost to erosion include the perimeter fence, generator house, the original site for electricity and tarred road leading to Judges’ Quarters. Other are the Boys Quarters for servants and house helps in the Judges’ Quarters, the water supply borehole and the part of the entrance to the Court complex. Mrs. Blessing Egbuche, a staff of the Federal High Court, told NAN that they no longer felt safe working under the prevailing circumstance. Egbuche said no part of the complex is safe now as each rainfall reduces the integrity of the buildings which already had visible cracks due to underground vibrations. She said electricity and water supplies were no longer available as they could no longer use the borehole and the transformer had been dismantled. Egbuche said they had cried to the Anambra Government and the Nigeria Erosion Watershed Management Project and had not received any assistance after they had visited severally. “We no longer feel safe and happy working here, the staff, the lawyers and judges can no longer use the convenience because there is no water, so that has resulted in the messing up of the whole place. “There is no light in the complex, maybe there is electricity supply but our transformer has been disconnected because erosion was swallowing it up and we had to call EEDC to come and remove it. “The borehole has collapsed, our 20,000 capacity water tank is there but we have emptied it to prevent it from going down into the gully soon,’’ she told NAN. “Now, the staff members tell you that they want to ease themselves outside the gate and leave from there, you cannot monitor them again. “The building is at the risk of collapse, we are not safe here anymore, we need urgent assistance to prevent this disaster,’’ she said. Also, Mrs. May Esealuka, Deputy Chief Registrar in the Court, lamented the possible loss of the multi-million naira complex to gully erosion. Esealuka told NAN that all efforts to get the Anambra Government and Ministry of Environment to intervene in the problem since it started were futile. According to her, we have sent letters to Anambra Government in November last year and all the people and agencies that matter in Anambra, including NEWMAP came and saw things for themselves. “What is happening here is sad, every moment my heart jumps that the worst will happen; there is no road to the Judges Quarters anymore. “For the past six months, we did not have light, no water supply, we have moved our generators to a safer side because the generator house has collapsed. “Since this thing started, nothing has been done to save it, NEWMAP at a time said I should call people at the top for release of funds, but am I supposed to talk, if not the people on ground. “We have been writing letters and making calls that some of them no longer pick my calls, we are begging whoever is in charge to save us, the media should help us to shout so that they can help us,’’ she said. NAN reports that it is not only the Federal High Court Complex that is at risk as the erosion is just few meters away from the Federal Secretariat still under construction. Some structures in the abandoned Three Arms Zone along Ekwueme Square have also been swalowed by the menace. Responding to the situation, Mr Emeka Achebe, Head of Communications in NEWMAP, said the World Bank Technical Team have visited the site and appreciated the enormity of Danger. Achebe said a special intervention plan known as “Gully Rapid Action and Slope Stabilisation (GRASS), has been approved for the site. According to him this will control damage and immediate threat to houses and other critical infrastructure, adding that remedial works will begin before the end of August. “GRASS has been approved by the World Bank for Ekwueme Square and activities will commence before end of month,’’ he said.